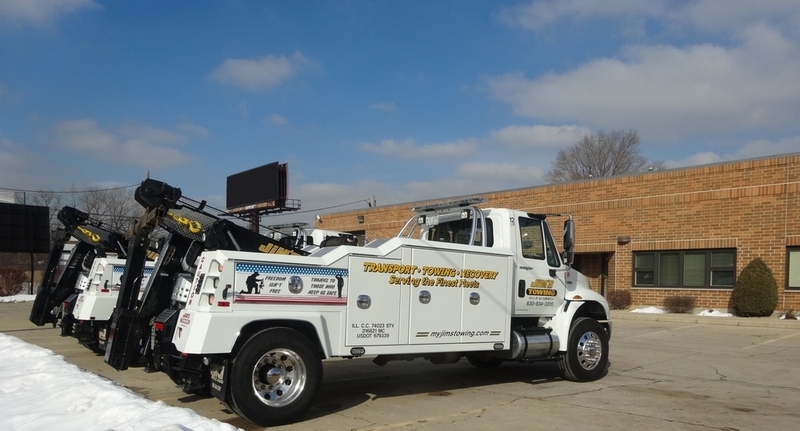 Jim's Towing has been serving the Chicago land and surrounding communities for over 40 years. We are available 24 hours a day, 7 days a week to service all of your light, medium and heavy duty towing, transport and recovery needs. We take pride in our equipment and facility, but most importantly, our drivers. They undergo rigorous training and work in a drug and alcohol free environment. Our drivers are background screened and operate under federal and state DOT guidelines. In 40 years of service, we are very proud of the awards & achievements we have received. We also put great emphasis on community involvement. It would be our pleasure to provide service for you. State-of-the-art equipment helps our drivers get the job completed professionally every time. Our facility keeps our entire fleet of trucks inside so they stay clean and ready to go when you need us. We specialize in many different services from heavy-duty truck towing to equipment transport and recovery. Jim's Towing is very proud of the awards & achievements we have accomplished throughout the years.